Little House Home Arts: Hobby or Addiction? We are still waiting for spring to come. The sun is out and it is warming up a bit but the plow piles are still five feet tall and we wonder if we will ever see green. We are having a Spring Sale in our Etsy Shop hoping to push spring into happening! I have used my time to create my new Easter wares as well as to prepare for projects to come. As you all know, I love to cut and have been having quite a time doing just that! It is hard to know when hobby becomes addiction, but I think I might be there? I can't wait to lay out my materials to create quilt tops. You noted that I didn't say quilts? I am taking this one step at a time, so as to not become overwhelmed. 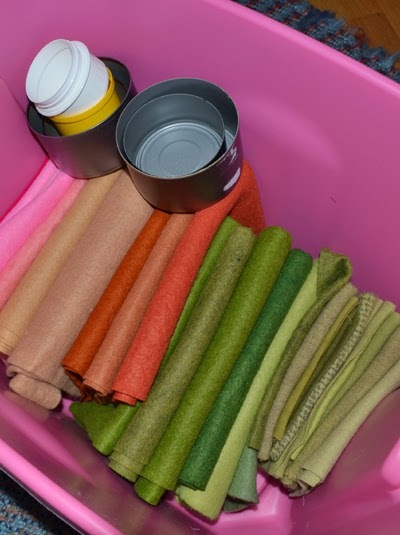 I also have a basket of ready made "kits" just waiting to be stitched. My oldest daughter, Hannah and I have been having some sewing bees. Her style is a bit different than mine. She has been pressing scraps, and then simply sits at the machine and starts piecing them together. 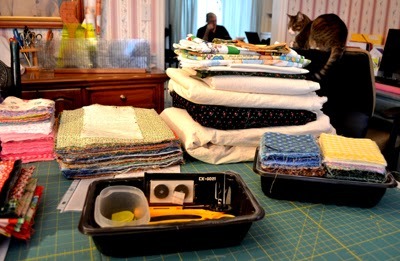 Some are rather big chunks of fabric, and ugly enough to make me think that she is likely making a quilt for the dog. She smiles and lets me know that that is not so...that it will be a beautiful quilt for me and demonstrates how snuggly it is to be as she covers her heart with a scrappy piece of what is to come. Although she is in her early thirties, she remains young at heart and loves to push my buttons with her humor. It is making me work faster so I can show her that despite her "threatened generosity", I have no need of what I envision to be the ugliest quilt ever! Mine will be done first and then I can suggest that she give her quilt to her sister or keep it for herself instead, just in case she is serious? Hannah's sewing has always been done in an impulsive style and if she couldn't find scissors, she would use whatever she could quickly find at hand to use, even fingernail clippers. Precision was never part of her skill set and I wonder if it ever will be? She gets up and goes to the cutting mat we have out on the dining room table and cuts her sewn pieces. 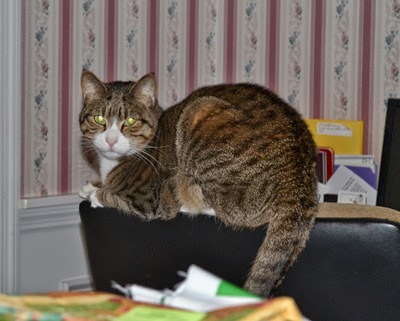 They are not the same sizes or shapes, and then she sits and sews again. When she is done she takes them back to the cutting board for another trim or two and the process goes on. 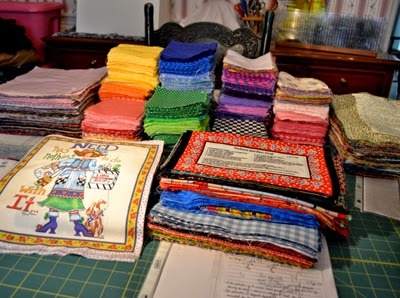 Then she lays them out on the table and I have to admit that her project has become, if not a very beautiful scrap quilt, a most interesting one, and I am amazed how this method works for her! The ugly fabrics aren't so noticeable, as they are cut down and not so dominating as they had been. It is random and crazy and who doesn't love the uniqueness in that? I realize how "traditional and old school" I have become...almost obsolete, I think? My prep time exceeds my sewing time and I am slow and methodical in my approach. Zeldie, my constant companion intrigued by my sewing mess! I took my first quilt lesson when I was about almost my daughter's age, though I had practiced some piecing using my mother's sewing scraps when I was but a child. My quilt class was taken at Bonnie Lehman's Quilts and Other Comforts in Lakewood, Colorado. It was then the home of the well-known Quilter's Newsletter. Like my daughter, Bonnie's daughter was a graphic artist. We all made a sampler quilt top and each block was chosen to teach us the various sorts of piecing techniques. Our quilt top was done in only twelve weeks though it took me about thirty years to hand-quilt it and it would likely still be unfinished without some help from my mom. I am not unlike my daughter and have my shortcomings too. Besides being painfully methodical in my approach, I hate to finish projects and must work hard to motivate myself to do so! Shortly after completing this class, I was laid off my job. I was a young nurse at the time but didn't want to work rotating shifts and so I took time away from my nursing career to work in this beautiful quilting store. My mother helped to support me as I got a discount on our purchases at the quilt shop which supported both me and my mom's quilting wants and needs. 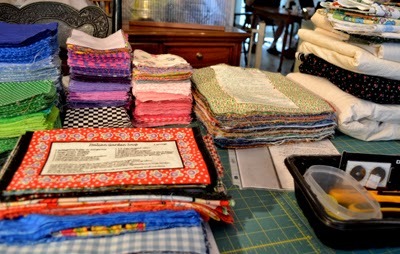 It was fun to see all the new fabrics and plan quilts, though much of my time was spent working instead of quilting. Not so with my mother, who also purchased lots of material and patterns with my discount and she returned to quilting after raising her family. Mom had learned to quilt as a child, where there was always a quilt up in a quilting frame to work on with her sisters. She learned how fun it is to sit around a quilting frame and quilt and create something beautiful and functional while connecting with those she loved. Her new creations were beyond functional! They were works of art. 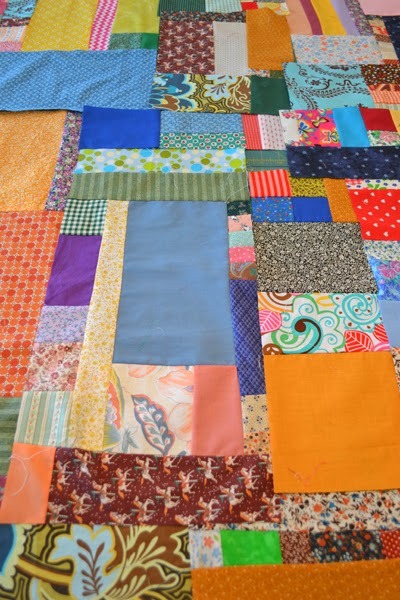 Some of her sisters followed her lead and returned to making quilts as well, while others were too glad to not have a quilting needle in hand and simply appreciated the blocks that she rejected as she made them into throw pillows for all her sisters. I taught her what I had just learned and joined in the fun. It became a bonding activity for the two of us for the rest of her life. It is so nice to spend special days or evenings with my daughter. We talk and get silly, as we design, cut and stitch on our projects parallel style, like toddlers that are so entertained with doing their own thing while their friends do the same right next to them. Spring will come and my daughter will soon take to her garden to wile away many hours and before long we will be back to canning together and putting up produce for the winter ahead, though with snow outside still and jars of produce still on our pantry shelves, I cannot think about that yet! I am indeed blessed to have a daughter to carry on the tradition of sewing bees and canning bees. I haven't ruled out that my other daughter will catch on to the fun she is missing, but for now I be will content with having one daughter that enjoys these creative gatherings. I have pulled out some of my UFO's (unfinished objects) and was so delighted to find stacks of cut materials. As mom aged she loved to do the mundane tasks that I love to do as well. I forgot that I had given her my materials to cut to make simple comforters for my nieces and nephews, her grandchildren. It filled her days with purpose, like it fills mine now.... here they all are, waiting to be stitched. I am going to do small steps on them while leaving plans and notes in plastic sleeves, so I can go from one project to another with less struggle to figure out what is next. My days, like my mother's are filled with purpose and feeling good about my accomplishments. It is hard to know if this is a hobby or addiction, but perhaps it doesn't matter? .....For those of you that don't know....I have been in a long term treatment program for Late Stage Lyme Disease. By eliminating Vitamin D, my immune system has been revved up for maximum kill off of this nasty infection. I have to stay out of the sunshine and minimize my exposure to light. A tiny light on my work is all that is needed. I make myself comfortable right here at home and stay ever so busy designing and creating. It is my therapy, and has become my life. Just recently I have read stories about surviving incredible odds. Being creative, and learning new skills not only keeps me active, productive and happy but research has shown it to be the best medicine ever and I hope to prove them right! Can you find "Waldo" and Zeldie?